In 1978, in between some business in Milan and Rome, I visited Florence over the weekend, and while strolling about, I suddenly exclaimed out to my traveling companion, "The Bromo Tower!" What I was looking at was the fourteenth-century tower of Palazzo Vecchio, the town hall of Florence. And it looked just like the Bromo Seltzer Tower in my hometown of Baltimore. So here's the story: It starts with Isaac Edward Emerson, a chemist, who moved to Baltimore in 1880 and opened a small drug store. He created a headache remedy of effervescent granules that he patented and named "Bromo Seltzer." Long before the age of what we think of as "branding," Emerson instinctively knew how to market and brand his product. He formed the Emerson Drug Company in 1887, and his marketing genius soon paid off, bringing him great wealth. One of the things Emerson did with his money was to found the Maryland Naval Reserves, and during the Spanish-American war, he financed an entire squadron that patrolled the Atlantic coast, on the watch for Spanish warships that never appeared. From this service, he was known as "Captain Emerson" from that time forward. Emerson later owned several yachts, which he used for extensive seagoing travel. Emerson often enjoyed dining in a restaurant in Baltimore's Little Italy. One day, his waitress was saying how much she missed her beautiful homeland of Italy. Captain Emerson decided to take her on voyage to Italy on one of his yachts... minus Mrs. Emerson! While touring Florence, Captain Emerson saw the tower of Palazzo Vecchio and was so impressed, he wired his architect, Joseph Evans Sperry, to begin work on a building featuring the same tower design. The building was completed in 1910, and besides the tower, included a factory wing for the manufacture of Bromo-Seltzer and administrative offices. The tower, now the tallest structure in Baltimore at 289 feet and fifteen floors, was premium office space, leased to elite Baltimore lawyers and wealthy businessmen. The Palazzo Vecchio's tower had one only clock, but Emerson told Sperry he wanted four clocks, and he wanted them big. 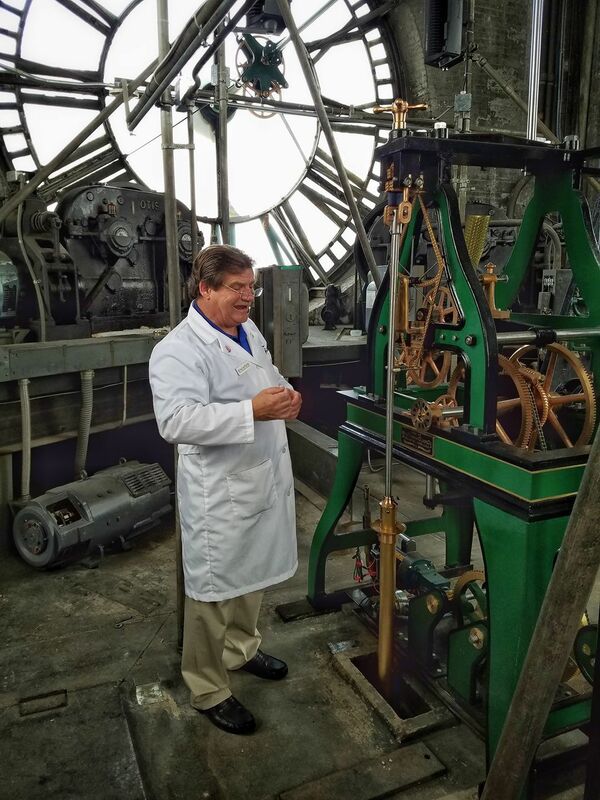 The clock dials are twenty-four feet in diameter, a full foot larger than those of Big Ben in London. In fact, Bromo Tower has the largest four dial gravity driven clock in the world. Always thinking about advertising and branding, Emerson had the building serve as a monumental advertisement. The clock faces, besides having Roman numerals to represent the hours, also have B-R-O-M-O-S-E-L-T-Z-E-R, yes, exactly twelve letters - around the rim of each dial at the hour locations. But even that wasn't enough for the Captain. 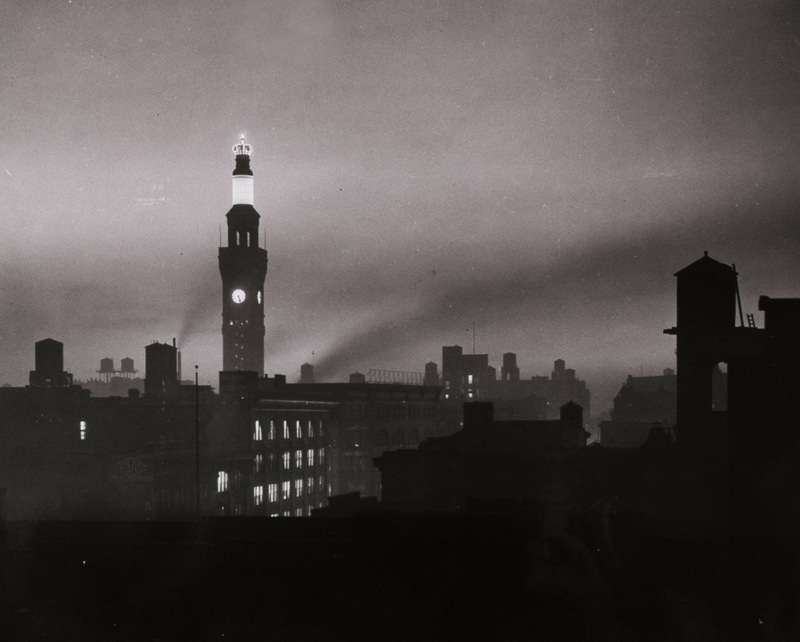 In 1911, he had a fifty-one foot replica of a Bromo Seltzer bottle erected on top of the tower. The bottle was painted the same familiar cobalt blue as the real thing, rotated at twice a minute, and at its top, had crown of 596 winking light bulbs that simulated Bromo Seltzer's fizz. Contemporaneous accounts say that the lights were visible up to 20 miles away, and ship captains and harbor pilots used them for reckoning their way up the Chesapeake Bay into Baltimore Harbor. Unfortunately, the 20-ton advertisement played structural havoc with the tower, and by the mid-30's, cracks had developed in the building. One day in 1936, Captain Emerson walked into work and told his men, "get it down," meaning the bottle. Knowing that the bottle itself was made of wood covered with painted tar paper on a steel frame, one of his lieutenants made the decision to just torch the thing. Baltimore residents were treated to a towering inferno, complete with large, flaming pieces of tar paper raining down on the sidewalk. Amazingly, no one was hurt, and the steel frame was cut up disposed of soon afterwards. The end of the Big Blue Bottle! The Bromo Seltzer empire continued until the 1970's when the FDA withdrew bromides as a class of sedatives from the market due to their toxicity. The "bromo" in Bromo Seltzer was sodium bromide, and the company soon went out of business. Fortunately, the Bromo Seltzer Tower lives on. After an extensive renovation in 2008, the Baltimore Office of Promotions & The Arts officially opened the Bromo Seltzer Arts Tower with studios spaces for visual and literary artists. And just this winter, the original Seth Thomas clockworks was completely restored and reinstalled. Seeing it operate is a thing of beauty, and you can go look for yourself any Saturday on one of several tours.